Spain’s opposition Socialists will elect a new leader on Sunday, in a an effort to reverse the party’s dramatic electoral decline and head off the challenge from new and existing parties to its left. After seven years in government, the Socialists were ousted by the right wing Popular Party in a landslide general election in 2011. Since, the party has continued to lose support. In an unprecedented electoral disaster the Socialist Workers’ party of Spain (PSOE) garnered just 23% down from 39% five years ago in the May European Parliament elections. The result gave rise to fears of yet another heavy defeat in next year’s general election. Alfredo Pérez Rubalcaba, the party leader who was part of the party’s old guard, having served under Jose Luis Zapatero and before him Felipe Gonzalez, announced his resignation to make way for fresh blood at the top. The two frontrunners to take his place – Eduardo Madina, 38, and Pedro Sánchez, 42 – are members of parliament. Neither has had experience at cabinet level or as a regional leader, the usual background for party leadership. This is bad according to orthodox thinking, but it had helped shield them from them a popular backlash against Spain’s political class over corruption scandals and the recent economic crisis. 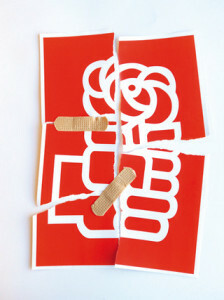 The party’s problems are in part rooted in issues specific to Spain, but PSOE’s recent decline reflects the broader troubles facing social democrats and other centre-left parties imposing austerity in Europe today in a spectacular own goal. In the case of Spain, the Socialists have been hit especially hard because the crisis started while they were in power, and because it was a Socialist government (after first trying to reflate the economy) that started implementing austerity measures. Polls show that many Spaniards continue to blame the economic downturn, which was prompted by the bursting a decade-long bank-fuelled housing bubble in 2008, on the previous government’s mismanagement. This has made it hard for the PSOE to capitalise on widespread discontent with brutal spending cuts, tax hikes and neo-liberal structural reforms pushed through by the right government of Mariano Rajoy. Voters have instead turned in big numbers to smaller parties on the left of PSOE: Izquierda Unida, which added 900,000 votes in the Euro elections, bringing its total to 1.5 million, or a 10% share, its best result since 1996; and Podemos, a movement founded only this year that won 8 per cent of the vote; and in the wealthy north eastern region of Catalonia in the throws of a bid for independence, Republican Left has emerged as the top vote-getter. The real problem with the change of the guard at the top of the socialist party is that it will not be accompanied by any significant change in policies that would appeal to the socialist base, which has been deserting the party for Podemos and IU. These parties that are now championing many of the social democratic policies abandoned by PSOE and and are successfully articulating popular demands for more democracy in the face of the dictatorship of the markets. Both socialist candidates have pledged to reverse the PP’s deregulatory labour market ‘reforms’, but otherwise seem remain totally wedded to the right wing policies and institutional structures that underpin Spain’s power establishment. This was recently demonstrated when both, despite declaring themselves republicans, stood with the party in backing the continuation of the Bourbon monarchy. This despite thousands taking to the streets calling for King Juan Carlos’ unexpected abdication to kick start a new Spanish Republic, rather his succession by Felipe VI. If polls show PSOE’s woes, it should not be forgotten that in the European elections the ruling Popular Party lost 2.6 million votes (16 percentage points), compared to the 2009 European parliament elections and 6.8 million votes (18.5 points) relative to the 2011 general elections. Together the two parties that have dominated Spain since its return to democracy 30 odd years ago now command less than 50% of the vote. The future doesn’t look bright for the socialists. But certainly, trying to imitate the Popular Party has got the party nowhere, and that’s still, in the words of Prof Maldonado, where its still heading. Any revival of support from PSOE’s traditional base necessarily means a shift to the Left, even if this strategy has clear risks. But whether PSOE or indeed any social democratic party in Europe capable of that – including the French socialists’ who, despite an even more dramatic collapse in the polls, continue to lurch rightwards – remains an open question.